Owen Clarke Design can setup and analyse your training and racing data to help you get up to speed faster, change gears, whether it be the adjustment of fore-aft trim, hiking, ballast, boards or sail-plan at the optimum time and so get the best out of your boat on the race course. We employ the unique approach and experiences of one of the worlds’ leading naval architects who also happens to be an experienced offshore racing yachtsman to do this. We will configure the data logging in your navigation software and we can provide an easy to use onboard event manager to record important information on the race course quickly and easily. We will then analyse the data for you and provide you with appropriate feedback whether that be in the form of daily/regatta/race reports to help with performance, calibration and navigation, or to formulate improvements in specific areas such as sail selection or appendages. Where does one start and what do sailing teams/owners get out of it? The starting point for getting to know the performance of your boat and understanding how to get the best out of her is theoretical data provided by the designer and sail-maker. Information on the boat’s speed initially comes in the form of calculated boat speed for a given true wind angle and direction. One should also have available an indication of sail selection and other factors such as ballast and daggerboard crossovers if they are fitted. A good sail-maker will also supply suggested cross-over charts but these would have to be produced with a knowledge of the righting moment (stiffness) of the boat and some other factors and to do this there will normally have to have been some collusion with the designer or the yacht be a known quantity, such as a one design class. All this data provides a useful starting point for reviewing and improving the performance of your yacht, making future sail selections/purchases and generally improving the seconds per mile performance of the boat, which is the goal. However, unless one really knows the true performance characteristics of the boat (and you might think you do, but do you? ), then you’re likely to be fritting away those seconds per mile that make the difference between being on the podium and not. Most owners also from time to time buy sails that just don’t seem to fit that well in the wardrobe as they had expected, some are downright wrong and perhaps they’re not getting the results from routing programs such as Expedition/MaxSea that they ought to be? The green and yellow points (Figure 1) overlaid on the yachts current cross-overs come from a sail testing session looking at upwind vmg which clearly shows that the J1 produces higher average boat speed numbers in 9.5 kts TWS than the J2. That is, that the J1 cross-over to the J2 is higher than originally thought and that that in higher wind speeds under the J2 the upwind target TWA is less than previously thought. Figure 2 shows polar values recorded during a session overlaid on the yacht’s current polars which can then be adjusted in Polar Manager producing modified polars for use by trimmers/drivers and in nav./routing software. So what’s the next stage? Well, it’s data logging and performance analysis and the development of ‘real life’ polars and cross-over charts. It is a never ending task and you will never get all the answers but pursuing even just a limited program either to improve your day to day sailing polars, or to look at a specific area/slice of sailing angles/wind speeds before purchasing some new sails will improve your understanding of the performance of your yacht, pay dividends in terms of seconds per mile and may avoid the purchase of an expensive ‘lemon’ of a sail. Who hasn’t had that experience? The bigger the boat, the more cost effective the analysis, but anyone who races their sailboat has something to learn. IACC, TP-52s, Volvo and Open 60 historically have spent many hundreds of hours on this type of analysis and it’s now available at an affordable level to everyone. OCD have been undertaking this type of analysis since 2010. In a recent program we sailed on the boat over Cowes Week, collected the data and reported to the team daily and at the end of the event. The results were then reviewed and used to change/make choices on tactics and how to sail the boat during the regatta on a daily basis, as well as to make choices on sail purchases over the winter. A difficult starting point (at least for Corinthian teams without a full time navigator) is that we need to turn up on a boat where the instruments, speed and wind are calibrated to start with, although one of the daily reports produced by the software is one for calibration which can help with to make adjustments during the test period. It’s less than ideal to turn up and make it a ‘do it on the day’ process as this wastes valuable time, no data collection is worth a damn while the instruments remain un-calibrated and experience tells us that calibration is in itself an ongoing process. It’s best not to start collecting data when the wind instruments have only been calibrated once in a fairly narrow range of wind speeds and sails at the masthead. So, before the data logging process is entered into their is unfortunately some level of expense and/or time required sailing the boat to get her ready, but you’ll have done this anyway before an important regatta or race, right? If you’ve looked at most everything else and your goal is to improve your performance then there are no easy short cuts. Designers note: We know better than anyone that the theoretical polars designers produce are not 100% accurate. Typically straight of the computer to some extent our own at least over estimate upwind speed, are good reaching and under estimate downwind speed. Sea conditions, wind shear, the limitations of theoretical lift/drag of stock sail libraries and the problems of imitating performance particularly in light airs are impossible to replicate for all boat types with even the most advanced VPP. However our experience shows us that by far the biggest errors are those brought in by poor and on smaller boats (because of lack of time) no instrument calibration. True wind speed and true wind angle are calculated values made from apparent wind angle and boat speed. One can particularly imagine that if there is any bias (and five degrees is not uncommon, ten sometimes downwind when spinnaker up-draft is not accounted for) then those carefully crafted expensive speed tables that show boat speed as a function of true wind speed and direction will be particularly inaccurate. Errors will be compounding themselves on both tacks/gybes, going upwind and vmg running – exactly the time when you need them to be the most accurate! So, the assumption is that we’d be turning up with instruments calibrated. The process then is that data during a trial sail or regatta is saved on a log file on the boat’s computer. Adrena, Expedition and Deckman all produce log files which we can import into our software and be use in the analysis. If you don’t have such programs on the boat, then we have to revert to old fashioned hand recording and notes which is a far less convenient and powerful way of collecting the data compared to a range of values every 1 second, but it’s better than nothing. The following description assumes however that we’ll have access to these log files which we can import directly into the performance analysis software we use. 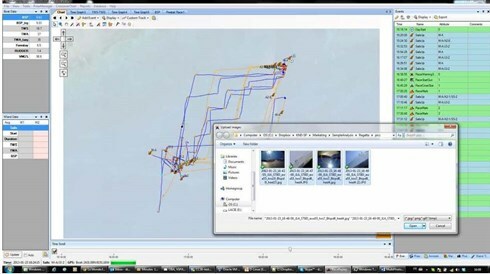 When it comes to recording data we like to use both input from sensors and manual notes, so our preference is to be on the boat with you, although we can analyse data just from the log files, either way however we need fastidious record keeping from onboard in addition to the electronically recorded data. This can come in the form of using Onboard Assistant (a data logging aid which comes as part of the software package) or paper notes. Expedition event logs can also be imported into the Race Reply software which also forms part of the performance analysis software package. With the exception of a notable few professional campaigns, few teams or owners have time devoted exclusively to testing. Occasionally though, pre-regatta or in training sessions a part of a day or a whole day may become available where we can look at specific questions. The key is to have as close to steady state conditions as possible, conditions of low or no wind shear and so keep the variables down to a minimum. The boat also has to be in race configuration/displacement and that means if she’s a fully crewed boat, with the right weight on the rail when applicable. When looking at rudder toe in angles (of twin rudder boats) or sail crossovers for instance, say between a J1 and a J2, or the angle to change/equivalence cross-over between a reaching and running sail then three five to ten minute test periods of one sail then the same period with the other can garner sufficient knowledge to make an objective judgement. Any statistician will always go for more samples, but we have to be practical and this is better than no data at all. One should consider this a minimum time period that if possible should be built on with further test results or real time information during regattas taken to build on the knowledge. It’s more than likely that wind conditions will change within the scope of a longer test time, up to ten minutes. Indeed, during say the windward leg of a regatta the wind conditions are likely to vary more than +/- 1 kt, that doesn’t mean we stop logging data. One of the functions within the software allows us to filter out unwanted data, ignoring data immediately before/after manoeuvres and ignoring inconsistent data. For that reason we normally select to acquire data inshore in thirty second phases within test periods and utilise longer phases offshore. If any of input streams fall out of there selected bands within this period then that phase is ignored for the purpose of data analysis. The onboard note taking should include ‘thoughts’, those typically that you have on the boat at any time...” waves are knocking the bow off”, “ looks like a lot shear”, “ feels fast, in a sweet spot”, “ not in the groove” etc. All this information along with timing of sail changes, position of cars, trimmers sheeting notes etc. help to understand the information provided by the sensors and contribute to the ‘human intel’ and judgements when presenting any final report. Onboard notes can be supplemented by pictures tied into timings and notes on the course. One of many attributes associated with software. Conditions, crew/ballast positions etc. and times of any equipment/hardware failures. The Race Reply software can then be updated and played back to the sailors to review the race and in conjunction with the raw data stored in the database used to analyse the various aspects of the boat and crew’s performance during the day. It’s not just about collecting data to update the speed polars or sail crossovers. If one has the time and/or this is an area of performance improvement one wants to look at one can zoom in to analyse your actions in the start sequence, entry and exit from marks, sailing angles and speeds out of tacks. With data collection points every second of the race there are any number of potential performance improvement aspects that can be looked at. The graphic below is a pictorial representation of the period up to an including the first race of the day. Particular aspects of the race are noted, turning marks etc and the lines in pink indicate times when useful data was collected. There is for most teams too much data and this is where we believe that with our unique take/overview as both designers and sailors adds value to the process and provides a cost effective, practical evaluation, sorting the wood from the trees. The ability to post process race/testing information and filter out unnecessary data quickly is we think the most important aspect of the software and along with data collection speeds of 1 Hz, the major advantage over hand taken recordings. The table below shows the kind of rata recorded that is recorded, in this case in thirty second phases. Processing the data usually starts on the way back in to the marina from the finish or the test area. If we were out for a few hours just looking at particular areas then sometimes some results can be had by the time one gets back to the dock, certainly in time for the evening dinner. Processing the data from a day out racing especially if it’s raw data provided by the team will take longer but the aim would be to have a summary report of the previous day ready for discussion with the ‘speed team’ on the boat before the next day’s racing. As a rule of thumb, it takes one hour of post processing/reviewing and reporting for every hour of data collected, plus some additional time at the end of a regatta or period of testing for a comprehensive report and recommendations. The table below shows an example of highest/target boat speeds attained at various wind angles/wind speeds during a race. The darker the blue, the more phases the data was extracted from and so the more reliable the data. It can take a whole regatta or series of regattas to arrive at sufficient points over a spread of wind speeds to produce a complete and accurate polar diagram. As naval architects however we are able to use Polar Manager software to adjust/massage the polars outside the range of test wind speeds to better represent the boats performance until more data is available. Other important trim/performance targets such as heel can be similarly adjusted and then saved into a database which is updated with each test session, so refining the boat’s performance information. Feedback is also available in a graphical format for reporting sessions/discussions with the team, such as the polar charts shown at the beginning of this section and in the graphics below which were used with the trimmers to discuss headstay and mainsheet trim and their affects on boat speed and balance/helm respectively. OCD charges at our daily sailing rate when out on the water, then an additional charge at the same hourly rate for work in the evenings post processing. We do this to be fair because every teams requirements and so time spent post processing are different. In many cases while the team are unwinding in the restaurant, we’re back in the hotel room doing room service and crunching data. For the time we spend producing a post regatta/testing report which draws inevitably on our experience as naval architects/designers we charge out at our standard daily design/project rate. To date, in terms of cost effectiveness both so far as sail selection, and performance improvement everyone we’ve worked with has found the input worth the expenditure in terms of time and hard currency.